So I’ll start off with I have lots more research to do before I consider taking the plunge on a GTP. I’ve always loved the way they looked, but there were other species I was more interested in keeping so hadn’t done any serious research before now. The reason for the change? My Mom has talked off and on about getting one of the blue phase morphs since we saw one at a show many years ago (believe it was a Trooper Walsh animal). I know a total blue morph is still out of my price range, but there are some high blue morphs that are a possibility (anticipating $1,500-$2,500). After showing her photos of some of the normal green GTP’s, she has some interest in those and the high yellow adults, but the high blue still wins out. So with some version of the blues in mind, I’ve been looking for US based breeders. I’ve only found two so far: Vibrant Viridis LLC & Viridis Pythons. I’d like to find out if anyone is familiar with either of them, and also recommendations for other reputable breeders. I’ve also found a couple of seemingly reputable GTP importers of CB juveniles from Indonesia, but that’s more risk (and potential headache) than I’m looking to take on. For all that I’m looking into this acquisition for my Mom, in reality the care is going to be all me if I do this...which still isn’t 100% sure yet. So anyway, US captive bred and born is what I’m searching for, but I’m not looking to purchase in the near future...probably a year out at the earliest. Glad to know I'm not the only one to plan a year out. And btw, the blues are gorgeous snakes! Caught my eye early on and will be on my list a few years out as they get more plentiful. Good luck! There is no guarantee for a neo to develop blue. You will run a better chance though with red neos which is why they are more money. 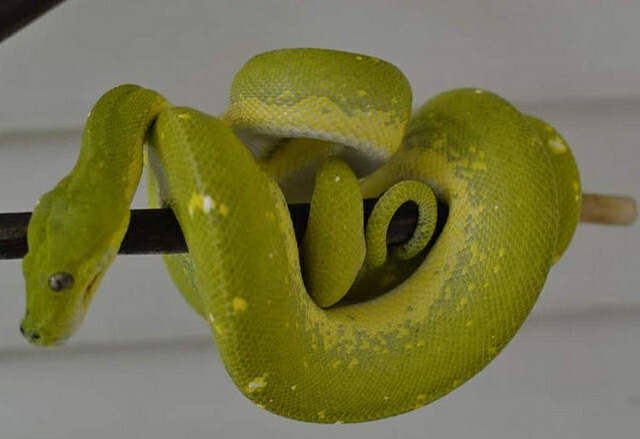 Dont be fooled if anyone tries and sells you a 'southern' chondro such as an Aru or Merauke red neo as true southerns dont have reds, only yellows. The northerns like Biaks, Sorongs and Manoks have reds. Also be careful about adults that are bright blue as females will go hormonal blue sometimes and keep the color for a while. And you can expect to pay a lot more than $1500 for some of them. Generally USCBB red neos will run you at least $900. As for some other breeders, there is Ian Bessell from S&J. There is also Justin Wilbanks who i bought Alex from but he deals pretty much in Biak and Biak crosses. There is also TK Chondros and Southern Chondros. There is also Bill Stegall and another who i cant remember atm lol. Also if looking for a high yellow, be wary as some people will try and sell Biaks as high yellows since they usually hold their baby colors for 3-5 years. I personally havent seen many high yellows aka Kofiau Island ones for sale. Here is a pic of Alex's dad who is an OSHY( Ophiological Services High Yellow aka Eugene Bessett). Thing is with GTPs, its all a gamble. The ugly duckling of the clutch could turn out to be the best and the best looking baby could turn out to be a blah adult. I am actually debating on getting another GTP once Alex's AP cage gets here. Thinking of getting an Aru this round or maybe a manok red neo since i have two Biaks already. Last edited by Sauzo; 12-29-2018 at 10:20 PM. Thanks Sauzo! I figure I still have a fair amount of research to do for setup and general care, as well as determining who to purchase from. I’ve read so far that they are less forgiving about husbandry errors than most of the other species I’ve kept, so I’ll definitely be setting up the enclosure well ahead of any purchase to get it dialed in. This will probably be a high tech setup since it will be at Mom’s (half hour away), so I’m looking at an rhp, misting system, and lights on a timer....basically as automated as I can make it. I’ve been looking at subadults that are already showing some blue, and leaning towards a male. The least expensive I’ve found so far was $1,750 and one stunning blue and green female for $2,750. The two breeders I found both seem to specialize in offering some of the blue phase animals, but they aren’t very common from what I’ve been able to find. The one solid blue I found said to inquire about price, which translates to if you have to ask you can’t afford it. If I end up making this purchase, I’m sure I’ll be here picking everyone’s brain. I would personally skip on a misting system. You dont want the cage constantly wet. Just get a good set up and use a hand pump mister. Spike it to around 80%, then let it dry out during the day. Too much humidity with no drying can lead to RIs and mold and stuff. Pat and Alex both arent big fans of being misted so i just soak down the cypress bedding good and let it dry out over a week.